Marbled Salamander, Ambystoma opacum. Location: Durham County, North Carolina, United States. Photograph by Patrick Coin, via Wikipedia. 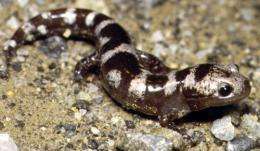 (PhysOrg.com) -- New research recently conducted by two ecologists, Wendy Palen at Simon Fraser University and Daniel Schindler at the University of Washington, finds that Pacific Northwest amphibian species are far less vulnerable to UV radiation than first thought. The Proceedings of the National Academy of Science has just published their findings. The two scientists conclude that an understanding of a species’ physiological tolerance isn’t enough to determine if it is threatened by UV radiation in its natural environment. For example, the researchers discovered that water clarity at breeding sites and the location where female frogs and salamanders lay their eggs could reduce their off springs’ exposure to UV. “We observed that some species that are sensitive at a physiological level exhibit behaviours that limit their exposure to harmful UV radiation in their natural environment,” says Palen. The SFU Canada Research Chair in aquatic conservation says this suggests that factors other than UV are more likely to threaten amphibian populations in the Pacific Northwest. During the last 15 years, the results of highly controlled experiments have led some researchers to propose that globally declining amphibian populations are linked to increasing levels of UV radiation penetrating the earth’s thinning atmosphere. These earlier tests showed that UV radiation could cause high mortality of some amphibian species in their aquatic stages (eggs and larvae). However, when Palen and Schindler conducted experiments across the full range of natural environments used by two Pacific Northwest amphibians they came up with very different conclusions. They discovered that less than two per cent of the most and least sensitive species’ embryos—long-toed salamanders and Cascades frogs respectively—are exposed to lethal levels of UV radiation in Olympic National Park. “When simple tests of species’ physiology are interpreted outside of an animal’s natural environment we can easily come to the wrong conclusion,” notes Palen. “Understanding where and when UV radiation is harmful will help us better predict the impact of global environmental changes on natural ecosystems. Twenty-five years ago, researchers warned that human use of aerosol and propellant sprays was thinning the atmosphere’s ozone layer, which would result in increased human cancers and species’ mortality. Ten years later, scientists proposed that increasing UV radiation was causing a global decline in frog and salamander populations. “If we had taken the results from a single experiment conducted in the most UV- exposed breeding site and assumed that those conditions were present everywhere the species breed, we would say that almost 100 per cent of the embryos are exposed to lethal UV levels. “To estimate UV vulnerability correctly, we need to account for the variation in the environment, not the conditions at any one site,” explains Palen.